Proper storage of ammunition is necessary for safety and helpful for ultimate organization. Plano developed the 50-Count Large Rifle Ammo Case to securely store .378 Weatherby Magnum, 375-300 Remington Ultra Magnum, .28 Remington or 25-06 Remington caliber ammunition. Bullets are stored safely in individual slots and covered with the flip-top lid. Double tabs keep the lid from spilling contents and a lock can even be added to ward off theft. 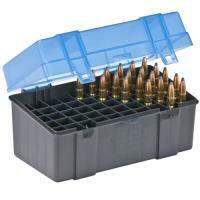 The box is designed to stack tightly, keeping large inventories of ammunition organized in a compact space. The case includes stickers to label box contents.